What a bloody nuisance Parliament is to the Tory government these days, when all the Prime Minister wants to do is get on with Brexit. 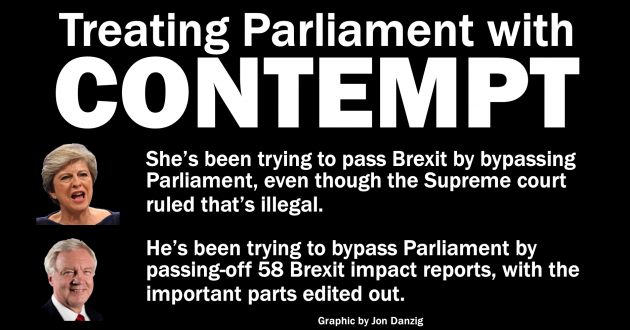 If only Parliament would stop interfering, she and her fellow Brexiter Ministers could make much more progress. I mean really, why do we need Parliament and the law when we have such competent people as Theresa May and David Davis? 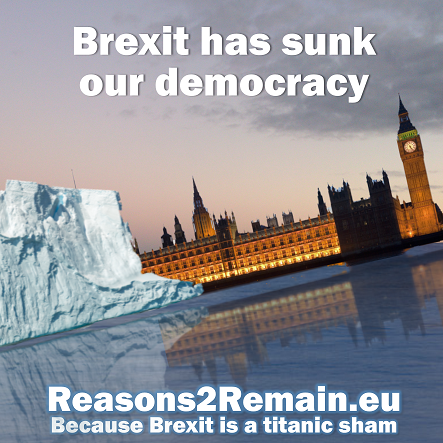 Honestly, all they want to do is to completely transform Britain to make it a much better country for … well, for all their rich mates, who hanker for a low-tax, low-regulation Britain. For God’s sake, they want THEIR country back. Is that too much to ask? Theresa May grabbed at the chance to become the Prime Minister to make Brexit happen. 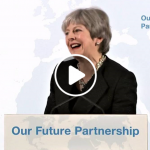 Yes, ok, she told the country just weeks earlier that leaving the European Union wouldn’t be in the country’s best interests. But, so what? Becoming Prime Minister was the opportunity of a lifetime. Nobody in their right mind would turn down such a great career move. Principles? Don’t be stoopid. Her first, then party, then… well that’s it. Will of the people! Sounds a bit hollow when most people didn’t actually vote for Brexit. But hey, keep repeating it and the mantra will stick. 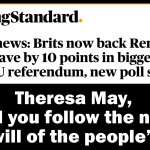 Will of the people! Will of the people! Brexit means Brexit! Brexit means Brexit! It’s going to be red, white and blue! Who says you can’t fool most of the people most of the time? Look, why does Parliament have to be involved in this when ‘the people’ have spoken? Of course Theresa May wanted to get Brexit passed without bothering Parliament with the finer details… or actually most of the details. You can’t blame Theresa May for calling upon the ancient, arcane Royal Prerogative to get Brexit done without the say-so of Parliament. I mean, Theresa May almost IS royalty. She’s Tory! Blue to the finger tips. Almost certainly blue blooded too. Cold blooded? All the better. I mean, namby-pamby human rights? Another bloody nuisance. Don’t get me started! Look, Theresa May, the clever girl, almost got away with it. Passing Brexit by bypassing Parliament. Did Parliament complain? Don’t make me laugh. Most MPs and Lords and Ladies wanted Britain to stay in the EU. But that advisory referendum soon shut them up, didn’t it? Look who’s sovereign now! If only that Gina Miller hadn’t interfered. Of course the High Court was wrong. Of course Mrs May was right to spend millions of pounds of our money to fight the ruling that went against her. Such a surprise that those judges in the Supreme Court ruled that Mrs May’s cunning plans to skip Parliamentary process would be illegal. What do they know about the law anyway? Enemies of the people! Did I say Theresa ‘almost’ got away with it? Slip of the keyboard. She DID get away with it. Parliament didn’t get to vote on a bill for Britain to leave the European Union. David Davis told Parliament it wasn’t necessary. They could skip that bit because the decision to leave the EU had already been made by THE PEOPLE! Sshh. I mean, please. Keep this to yourselves. David Davis was lying. Yes, lying to Parliament. The referendum wasn’t capable of making any decision. It was advisory only. Not legally binding. So who has made the official, legally-binding, pukka decision to leave the European Union? Well, um, nobody! Isn’t it wonderful? Britain is leaving the EU without any proper sanction. Did I say Theresa was clever? Some lawyers are working right now to challenge in the courts that Britain is almost certainly leaving the EU illegally. But please, don’t encourage them. They need a lot of money to take their case forward. It will just prove to be yet another bloody nuisance to Mrs May’s plans. You do want her to be successful in transforming Britain forever, don’t you? Another clever wheeze of this amazing Tory government is the way they’re getting Parliament to vote to transfer all EU laws and protections into British law. Then, no need for any more Parliamentary involvement. Government ministers will be free to keep, amend or scrap those laws and protections without the interference of Parliament. It’s called Henry VIII clauses. Good old Henry. Did I type protections? Another keyboard slip. Of course Tory ministers won’t want to keep protections after Brexit. Don’t you have any understanding of what this is all about? Yes, it’s important to pay lip service to Parliamentary democracy. Keep them busy, I say. Yes, yes, Parliament can have a say on the final Brexit deal. Why not? The choice is take it or leave it. Deal or no deal, we’re still leaving the EU. Parliamentarians will be allowed to vote on whether they like the final deal or not. But like it or not, it won’t make any difference. Brexit, here we come! That David Davis, he likes to boast a bit, but he’s doing a grand job, don’t you think? He blustered to Parliament, and on the telly, that he’s prepared 58 Brexit impact reports. Of course they have to be kept secret. If people found out the truth about Brexit, they might not want it anymore. But you can see how Parliament got in the way again. Bloody Parliament! They voted to see those 58 impact reports. Why on earth do they need to see them? What business is it of theirs? Really. So, good old David has done the honourable thing and handed over the documents. He’s a jolly good fellow! Yes, ok, to protect the country from knowing the truth about Brexit, he and his team had to spend the night blacking out all the sensitive bits with a huge felt tip pen. Actually, hundreds of felt-tip pens. Why not? Heaven forbid. If people got to see that information, the Brexit game would be rumbled. Seriously. David says it’s because the information would damage his negotiations with the EU. Good one, David! Of course, the EU already know everything there is to know. They openly published dozens of Brexit impact reports months ago. Brexit is going to be a disaster. That’s what the blacked-out bits say in David’s secret reports. That’s why he cannot possibly publish them. Duh! Don’t you get that? Amazing that this Tory government doesn’t even have a majority in Parliament. 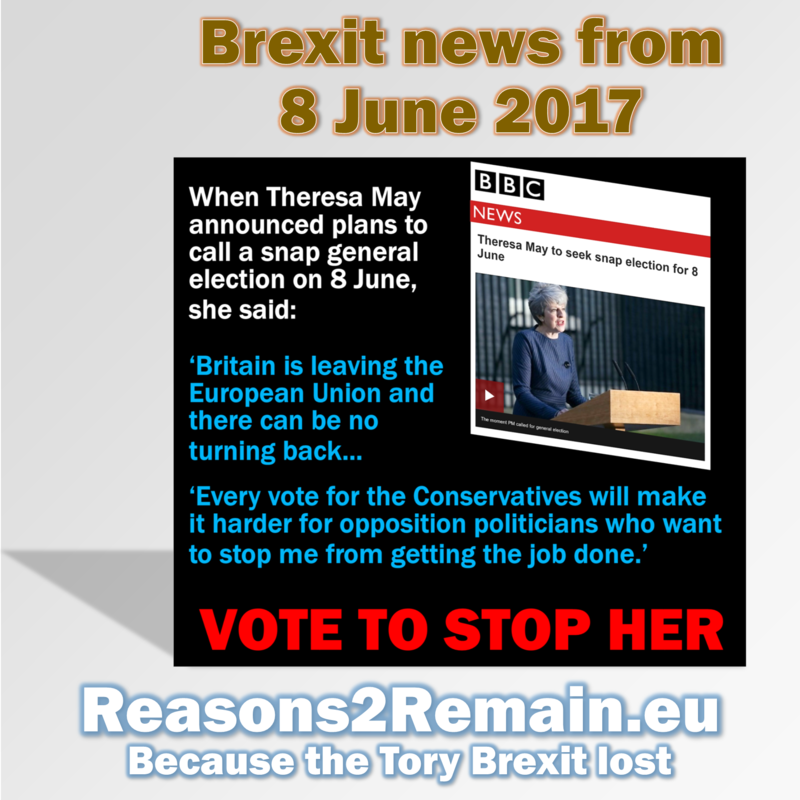 In June’s general election, Theresa May asked for a landslide to get a mandate for her Brexit plans. Instead, she lost her majority entirely. But she hasn’t lost the plot. She’s carrying on as if the general election hadn’t happened. Contempt? Oh, it’s much more than that. It’s a coup. The cleverest, sneakiest coup you could ever imagine. Parliament, and the people, are asleep whilst plans are being made without them. Let’s hope nobody wakes up too soon. We don’t want any more bloody nuisances getting in the way of Brexit, do we? 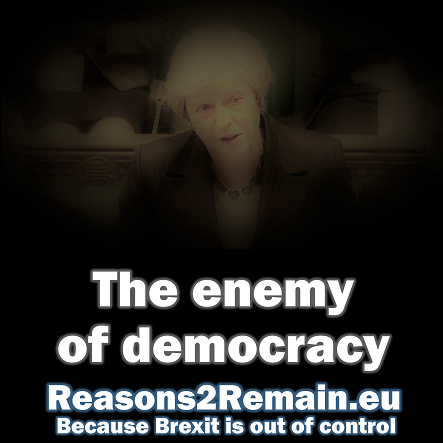 This entry was posted in Current Affairs, Democracy & Citizenship, Economics & Trade, Global & International, Media & Communications, Politics & Public Policy, The EU and tagged brexit, David Davis, European Union, Theresa May, Tory Party. Bookmark the permalink. Previous: Has Corbyn seen the light on Brexit?